Americana Chalkboard Paint can transform a wide range of surfaces into chalkboards. 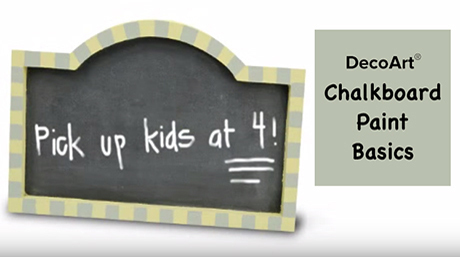 Create trendy chalkboard writing surface projects such as memo boards, canister labels, kid's wall décor, and more. Available in 2 oz, 4 oz, and 8 oz bottles for smaller craft projects. Shake well. Apply one coat horizontally and allow to dry for one hour. Apply the second coat vertically and allow to dry. Let cure for 24 hours. Condition surface by lightly rubbing the side of a piece of chalk across it. When using on rough or porous surfaces, sand smooth and then prime with Multi-Purpose Sealer. 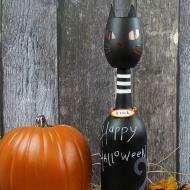 Get inspired with our craft and DIY project ideas made with chalkboard products. 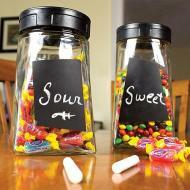 Organize your home with chalkboard paint and reusable, stick-on label stencils.